Description A black and white photograph giving a view of early Blenheim whilst in flood. 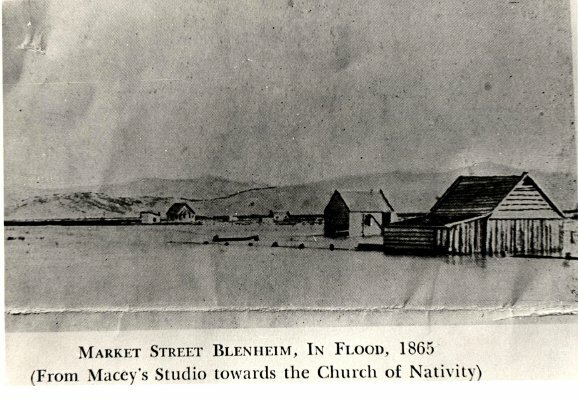 Written at the bottom of the photograph is, "Market Street Blenheim, in flood, 1865 (from Macey's Studio towards the Church of Nativity). Clearly visible in this photograph is the fold made when a copy has been made omitting the writing on the bottom. Information as typed by Norm Brayshaw: "Market street, Blenheim, 1865". Copied by Norm Brayshaw in 1960 from a booklet of the town. Includes a negative. There is another photograph in the packet which shows the same view but with the wording cut off.